At 824.269 km² ( 318.7 mi²) is almost four times as big as the United Kingdom. After Mongolia, Namibia is the least densely populated country in the world at 2.5 inhabitants per square kilometer ( 6.5/mi²). The total population count is 1.83 million. This is due to the fact that Namibia is the most arid country south of the Sahara. 55% of the country is arid or very dry, and the average yearly rainfall is 270mm (approx 12 inches). Namibia was not extensively explored by Europeans until the 19th century, when it became a German colony known as German South West Africa (Deutsch-Südwestafrika), apart from Walvis Bay which was under British control. South Africa occupied the colony during World War I and occupied it until World War II, when it unilaterally annexed the territory without international recognition. In1966, the South West Africa People’s Organisation (SWAPO) the military wing of the People’s Liberation Army of Namibia , a guerrilla group, launched a war of independence. It wasn’t until 1988 that South Africa agreed to end it’s administration of Namibia in accordance with a United Nations peace plan for the entire region. 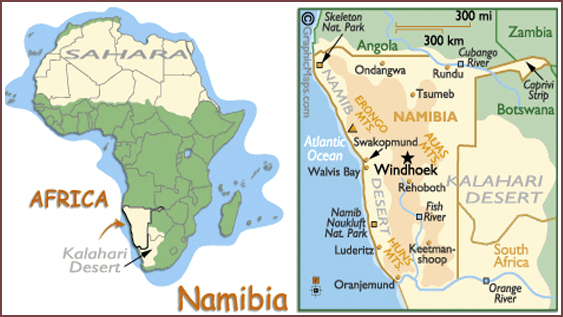 Independence came in 1990, and Walvis Bay was ceded to Namibia in 1994 when apartheid came to an end in South Africa. The politics of Namibia takes place in the framework of a presidential representative democratic republic. The president of Namibia is elected to a five year term, and is both head of state and of the government.The country is divided into 13 regions, and 102 constituencies. 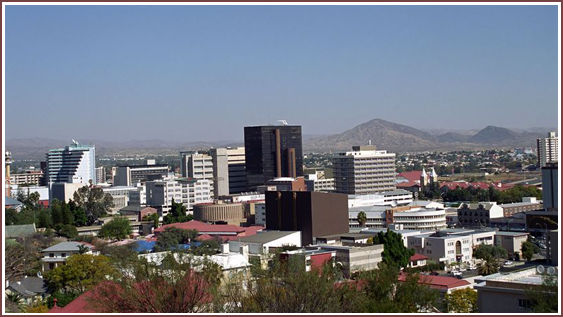 The capital is Windhoek, located in the center of the country. 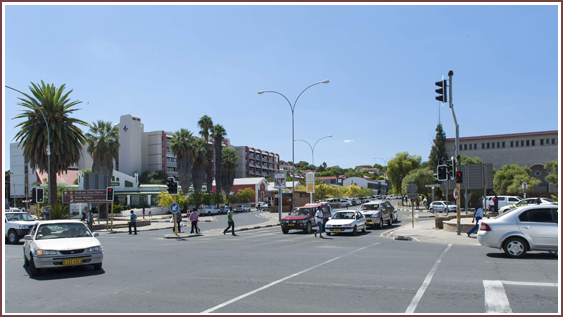 Other important towns are the ports of Walvis Bay and Swakopmund as well as Oshakati and Grootfontein. Namibia has a pleasant climate. The summer months are hot and temperatures of 35°C (95°F) or more are not unusual in the South and in the North of the country. The winter months are cool, and temperatures can sink to below 0°C ( 32°F). There is often fog along the coastline, clearing in the morning and returning in the afternoons. 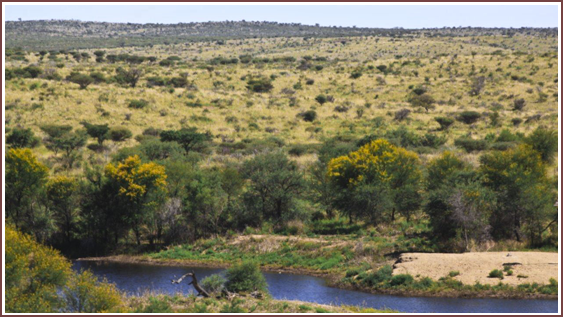 The Namibian landscape consists of five geographical areas, each with it’s own characteristic abiotic conditions and vegetation, with some overlap between them. 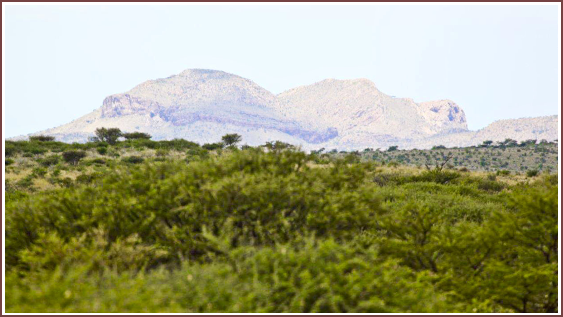 They are as follows; the Central plateau, the Namib desert, the Escarpment, the Bushveld and the Kalahari desert. The Namib desert in the West and the Kalahari desert in the East take up about 22% of the land. 58% of vegetation is savannah ,and the remaining 20% is a mixture of forest and savannah. 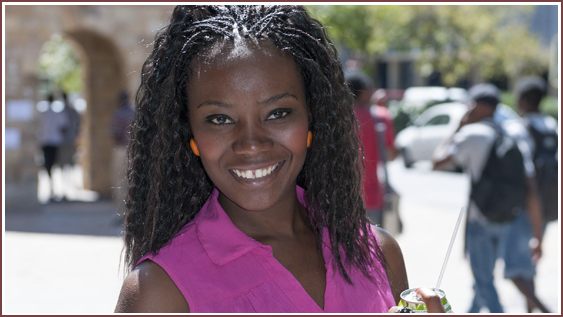 The population is diverse, from the nomadic,pastoral Himba in the North East to the hunter gatherer San in the East. The Himba breed cattle and goats,they wear little clothing and the women are famous for covering themselves with a mixture of butterfat,ochre and herbs to protect themselves from the sun. The San get their food from the wild, foraging and hunting plants and animals without domesticating either. Their settlements might be either permanent or temporary or a combination of the two. 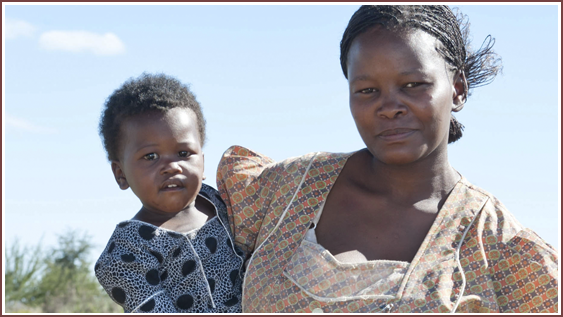 Today many of the San live in parts of the Kalahari where they are better able to preserve their culture. Other groups are the Owambo, Kavango and the Damara,Nama and Herero. There are also the people of mixed racial origins and the whites of European ancestry. The economy consists of agriculture,fishing and mining and these together account for 25% of the countries GDP (Gross Domestic Product). Namibia is the largest producer of diamonds in the world. Other important minerals mined are uranium,tin,copper,lead and zinc. Tourism also plays an important role in the economy.